Distinct stretch of open moorland including the important Iron Age hillfort on the crest of the hills. The character area falls partly within the ancient ecclesiastical parishes of Llandyrnog and partly within the parish of Nannerch which extends to the eastern side of the Clwydian hills. Llandyrnog lay within the commote of Dogfeilyn in the medieval cantref of Dyffryn Clwyd, later to become the medieval lordship of Ruthin, the crest of Clwydian hills at this point having formed the boundary between Dyffryn Clwyd and the cantref of Tegeingl, along the historic boundary between the counties of Denbighshire and Flintshire. 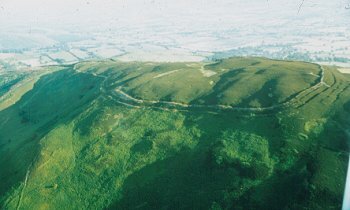 Penycloddiau, one of the largest Iron Age hillforts in Wales, is the major archaeological site which falls within the character area, its massive ramparts formed of rock quarried from the encircling ditches. Like the hillforts in the Moel Famau character area, the hillfort may represent the focus of a late prehistoric tribal territory which extended across the vale to the west to the west of the Clwydian hills. Steep-sided, flat-topped ridge, rising from about 295m to a peak of 440m above OD on the summit of Penycloddiau, extending northwards to the steep northern slopes of Moel y Parc above the gorge of Afon Chwiler. The moorland is largely unenclosed and the area is therefore clearly defined from the enclosed farmland to the west which generally runs along the 180-200 metre contour. Land-use is predominantly unimproved upland pasture with extensive areas of bracken and heather and clumps of gorse, with occasional scattered and isolated low ash, birch and hawthorn shrubs on lower ground. Outcrops of shaley rock to the south-east of Penycloddiau. Divided from the enclosed land and forestry to the west by a dilapidated dry-stone mountain wall which is either free-standing or acting as a revetment to a terrace cut into the hillside, partly tumbled and overgrown and replaced by post and wire fencing. Divided from the enclosed land on the south and east by single or double banks and ditches surmounted by post and wire fences. The area is physically separated from the similar character area of Moel Famau to the south by the pass which takes a minor road between Llangwyfan and Nannerch. Small upland ponds and boggy areas, of potential palaeoenvironmental importance, including one within the hillfort itself. The modern north-south Offa's Dyke Path runs north-south across the area, running along the western ramparts of the Penycloddiau hillfort. Erosion prevention works, but some continuing visitor erosion and sheep scrapes at the southern entrance to Penycloddiau hillfort and some erosion by wheeled vehicles at the northern of the two eastern hillfort entrances.